Apparently you can’t tell the truth about the ongoing war against European-Americans — 1389 Blog - Counterjihad! If you’re white, not only must you accept being bullied and robbed and heaped with contempt at every turn, but also you must never mention that any of this is taking place. The Philadelphia Magazine article, Being White in Philly: Whites, race, class, and the things that never get said, contains many brief interviews with white Philadelphians on race relations. The comments below the article tell even more. Thanks to Obamunism, I live in a battered old RV in an unincorporated area. Yeah, I work part-time retail, despite an excellent education, many years of IT experience, recently upgraded skills, good references, a clean record, you name it. But then, white people haven’t fared very well in Zimbabwe since the place was handed on a platter to Robert Mugabe. I won’t say that it’s never possible for black people to run a city, state, or country without making it into a complete hellhole, but I doubt I will live to see it. Weasel Zippers reports that Philadelphia Dem Mayor Wants Author Of Story On Black-White Race Relations Punished, Suggests Not Protected Free Speech…. White people already risk social and economic ostracism if we discuss the fact that we are no longer safe in a political jurisdiction that has been hijacked by a militant minority of another race who, for the most part, have been taught to hate and despise us. Now Mayor Michael Nutter insists that Philadelphia Magazine should be punished for having reported the simple fact that white people are forbidden to talk about matters of race. In other words, we dare not even acknowledge that we are being censored! Say goodbye to the First Amendment whenever it interferes with the interests of our new overlords. It is only free speech, if it is their speech. The truth is their enemy and they will fight it using any means, even if it takes one losing their constitutional rights. It is all about Spite. Living under the tyranny of urban ghetto thugs, either in one particular city or in the US as a whole – and not even being allowed to discuss it – is not an option. A heavily politicized Democrat political machine, backed by an overwhelming majority of African-Americans, has been allowed to hijack the entirety of the US body politic. Anyone who voted for Obama simply because he is half-black is a racist. This Democrat administration has enacted “Obamacare” – against the expressed intentions of the majority of the population – with the effect, and most likely the intent, of destroying both the health care system and the entire economy. Bare physical survival is becoming ever more difficult for most white people in the US. We are not part of the socialist apparatchiki; we lose employment opportunities while others receive preferential treatment via affirmative action; and we are unwilling to milk what little is left of the US economy by scamming the welfare system. So we try to piece together a living from low-paying part-time jobs as we slowly sink into destitution. Black people are being indoctrinated in many ways to hate and despise white people and to blame us for all of the personal problems and failures that they may experience as a part of the human condition. Present-day white people are, by and large, neither racists nor white supremacists. We have neither profited from any “white privilege” nor have we harmed persons of other races. White people lose their livelihood and their personal security if they mention the fact that there is a race war against them – even though white people do not retaliate and do not intend to retaliate. White people are threatened if they acknowledge the fact that they are being censored from discussing matters of race prejudice against them. I have been called a “racist” for putting up this article. This cannot end well – for anyone. If your purpose in taking over a government is to exact vengeance on another group of people who previously ran things reasonably well, your homeland will become a hellhole for everyone, including your own people. South Africa and Zimbabwe are but two of many examples. You will have only yourselves to blame. I can forgive you, my soon-to-be-former countrymen, in that I do not wish you ill. But asking me to stay here and go down with the shipwreck that you created is asking too much. I believe that I may have some productive years left, and I am not about to throw them away by remaining in what was once, but no longer is, and probably will never be again, the storied land of opportunity. “Yes, This Is War.” When Blacks Say It, Maybe Whites Should Take Them Seriously? When Does the White Working Class Get Amnestied? What should we expect from fallout resulting from such a divisive president? He just loves this, and all those he has infected with hate against their white Americans also just love this; they are so caught up in “getting off” on bullying tactics that they can’t see how hypocritically they are portraying themselves by participating in the same violence which was practiced on them The thing about attempts to muzzle free speech however is that when a lid is put on it in one area it explodes in a different area, in this case, through social media which is the mainstream media anyway. If we have learned one thing from history it’s that trying to silence unfair treatment has never been successful to the silencer; it always comes out eventually and disparages the oppressors and they end up losing sympathy. Of all people African Americans should remember this much. The people who own the media decide what’s fit to print. They are the same people who taught us to sing “I’d like to buy the world a Coke” and the famous mantra “Diversity is Our Strength”. Everybody is getting manipulated here and the blacks and latinos are ‘valuable’ for their stereotypical violent natures. The FIRST thing people in this country should do is unplug themselves from the mind control machine we call entertainment. I’ll keep blogging, as best I can. By the way…do you know Wordpress? Race relations in America have become a Gordian Knot. Since Obama took office, race relations in America have degenerated so far that it’s mind boggling! For reasons of personal security, I can’t reveal that yet. We left Canada to live in Costa Rica due to Canada’s government pandering to privilaged minority groups, and their spending of “billions” of dollars to educate, house, and feed massive numbers of third world immigrants. The new police state Censorship Laws in Canada is now resulting in citizens being jailed for simply asking questions. Type Brad Love into any search engine, and read about a Canadian construction worker who was imprisoned for “eighteen months”, for simply demanding that government explain to him why they are importing Jamaican gangs, who are responsible for over 95% of all gun related crimes in Toronto Canada. Costa Rica politicians do not cater to any foreign culturreal groups, and there is no welfare system for immigrants, and Christmas is still celibrated here. Canada will have a fully Muslim government by 2040, due to cultural birth rates and an excessive immigration program. Thank God I’m here, but I feel bad for my grandchildren back in Canada. The rest of the country is learning what I knew 30 years ago. If you can get out and go someplace safe, then I wish you good travels and hope you will have internet access so you’ll still be around. I would miss you a lot more than you know if you ever went offline. I don’t ever want to say “goodbye” to you. Of course I have the burning curiosity as to where you might have in mind to go to, but I understand why the answer to those questions are better left unsaid for your own protection. Probably best not to say when you are leaving too, maybe save the leaving announcement for after you’ve already left since you do have some messed up people who hate you for all the truth telling that you do. So, Godspeed, 1389, my dear friend, wherever and whenever you go, please know that no matter where you are in the world, you will also still be in my heart, my thoughts, and my prayers. God bless you. Overall, most white are unconcerned with racial matters, the result of decades trying to get along with our fellow citizens and to treat everyone fairly. It has reached a point where the last racists in America are black, Hispanic and Asian (I would throw Muslims into the mix, but since they hate everyone, they are a special case), and now if you do not agree with the racists, then you yourself are racist. Being the last bastion of racial hatred in America, it’s no wonder blacks and others side so solidly with the intolerant left. You never hear about Uruguay in the news. That’s a huge selling point for me. Come to Australia and we will welcome you with open arms. We are still very free here. Living expenses and houses are very very expensive but that is because we have very high wages (base wages $16 per hour for supermarket work but housing rents $300 per week for a 1 bedroom flat). Only down side is that we have very strict gun laws but join a gun club and you will be fine. Weather is great, wide open spaces, real estate in the outback (rural areas) still fairly cheap. Joining a gun club in Canada would most likely result in government conducting an investigation into your criminal record, your mental stability, or even if you’ve recently gone through a divorce etc. Reading email messages of a gun club applicant would also be expected due to Canada’s new Internet Censhorship laws, and the fact it now has a police state government. I have a South Korean father and a mother who is of English, German, Scots, French, Norman and Flanders descent. Both of my parents are what I would consider Conservative to varying degrees (My father, who is ex-military, is more of a fiscal conservative and my mother is more of a social conservative.) I was fortunate to spend a great deal of time with my maternal grandparents during my formative years, it greatly influenced the man that I would become later in life. My ethnic background has given me unique perspectives and experiences while growing up and throughout the adult years of my life. You might think I harbor hatred for the Japanese because of what they did to both of my peoples. Why should I? Nobody alive today over there really holds any responsibility for the Japanese occupation of Korea nor for the bombing of Pearl Harbor. As far as I am concerned, it’s all in the past. Many of my ancestors were rich slave owners. I was a military brat and I am also former military, I’ve made friends with about everybody, regardless of skin color or religion. Come to think of it the only ones I never really got along with you might say were flaming liberals, you know, the ones that treat everyone like crap who don’t share a similar viewpoint. Nobody alive today really holds any responsibility for pre-civil war slavery and most of the pro-segregation democrats have died. So why do Black-Americans hold so much hatred for my Euro-American family? Why can’t more people follow the example of Dr. Carson, Herman Cain or Lt. Col. West? The past couple of years I have spent a fair amount of time researching my family history, several of my CONUS lines go all the way back to the 1630’s colonial Virginia, Massachusetts and Connecticut, if you can think of it, I’ve likely had it in my family. I’ve even found a Hancock and a Lee in the tree from England, so there’s a good possibility that some of the Founding Fathers are my cousins. All of this heritage some good and some of it bad, is something I am damned proud of and will pass on to my own children. I’d reckon many of those thugs you mention in your article have no clue nor even a particle of interest to where they came from and most of them for generations have grown up in a failed system with very weak family and moral support. We all know what is wrong with the world today and I have a sinking feeling things are only going to get worse. While we may be in a slow economic upturn, I really think it is only a matter of time before we see another crash. Could it be the one that finally sends us over the edge? Possibly, many folks are living from paycheck to paycheck and I’d hate to be around the welfare crowd when the food stamps stop flowing. Get out of the big cities, they are just death traps waiting to happen. Regardless of ethnicity, I think it is highly imperative for Conservatives to begin banding together and forming strong communities in order to survive the coming chaos. Perhaps we might be able to rebuild the country after all the liberals have killed each other off. Several days from now, I will feature your comment at my site. I want to discuss this topic with my blog followers! Editor’s note: We have removed two anti-Semitic words from this otherwise interesting comment. This is not an anti-Semitic blog and such remarks will not be tolerated. As a white man born in Canada in the 1940s, my only exposure was to European immigrants, I never seen a black person until I was about ten years of age, and there was only one in our neighbourhood, he was a great kid. In the mid 1960s prime minister Lestor Pearson (afraid of the labour unions being formed by European immigrants), stopped all immigration from Europe, and switched over to excessive immigration from third world countries. This decision broke the labour union movement in Canada, and provided cheap labour for the factories. After more than forty years of excessive immigration (at the cost of 23 billion dollars per year), Canada is now in the worse mess it’s ever been in. Social programs are suffering due to lack of funds, including the closing of swimming pools and libraries, the health care system is so bad that I can’t even get a family doctor “at age 65”, and politicians are pandering to minority groups to secure more votes. We once had very little debt in Canada, now we owe China 616 Billion dollars and can hardly pay the interest on that debt. Now retired, my wife and I have fled to Costa Rica, where immigrants must support themselves, and are not a financial burden on that country. I wish I’d left Canada many years ago, I feel like I wasted my life here. All of you who are leaving, once you start running, you never stop. Ask the immigrants to the US who have commented here to say they are running again. Rootless, homeless, poor gypsys. I will say that if you’re leaving, you didn’t belong anyway. I have heard from some immigrants who are indeed deeply disappointed at what has happened to their adopted home. We are rapidly becoming the new Soviet Bloc that so many were so desperate to leave. Instead of leaving your ancestral home and history, you should stay and work to fix it, I assume you have family there. If the US tanks, all the other countries are going to tank as well, we’re about 1/4 of the global economy. If the next “Great Depression” happens, the natives of where ever aren’t going to want you there and you’ll be moving again. It never ends until you get back home. I’m in and from the South. Nothing is more irritating to me than all these stupid Yankees who move here from their ruined blues states and immediately start voting for the same idiotic policies and insinuating their horrid culture into ours. I wish the economy would take a nose dive, then they would all leave since They have no roots here, no attachment to history or culture. This land is our land, its not necessarily theirs, or yours. There never has been and probably never will be a free “proposition nation”, it takes a firm hand to keep all the disparate cultures in line. I wish you the best, I hope you enjoy your stay in Latin America and nothing bad happens, but wandering the world looking for something better rarely works. The US is not my ancestral home. I’m a Serbian-American and the US has done its best to destroy my ancestral home. I agree that we were on the wrong side of that mess. There is a Serbian immigrant community here and a Serbian language Orthodox Church. The Serbs I have met are decent people,I have nothing against them, they work and pay taxes and aren’t criminals, but they are Serbian not American and certainly not Southern. It takes generations to become a local, in the mean time they are just sojourners. How can you trust a sojourner when the chips are down? There is little to tie them to the land or the culture. They have no roots here, their roots are in Serbia. This idea of being able to go wherever in the world you want and be accepted is a modern, multi-cultural, marxist lie. I am not trying to start a fight, I just read the post and saw you were planning to run away and saw all the commenters planning to run away, or who already had, and got a little annoyed at the mercenary mind set. To paraphrase what I said in my first comment, if you’re running away when things get tough, you didn’t belong in the first place. St. Paul man in coma, faces permanent brain damage, after black mob of 50 pummels him — 1389 Blog - Counterjihad! 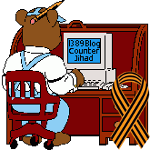 Why I don’t give a rat’s patootie about whether Donald Sterling is a racist — 1389 Blog - Counterjihad!